Creating a more balanced dog. Upward Dog Services offers quality dog care and balanced training, based in Annapolis, Maryland and serving surrounding areas. Our goal is to provide the best experience for you and your dog. Training services far exceed basic obedience classes and help you create a stronger relationship and better communication with your dog. Allow your pet to become a part of the family while under our care. Thanks to Ms. Rentch’s class at Hillsmere Elementary School for having us back this year! We cannot thank Sarah enough. She not only trained our dog, but was also so patient with us, teaching us how to continue building her confidence (and our confidence in her). We rescued Lucy earlier in the year, not knowing anything of her past. We got as far as we could with basic obedience and house manners, but got frustrated and overwhelmed with her aggression. She reacted on the leash to strangers and other dogs (really anything), and walking her was a constant battle. We also couldn’t have people over without putting her in a crate or leashing her and she would growl and never settle down. Sarah was able to show us that she wasn’t an aggressive dog, she was an insecure dog who didn’t know her place in our pack. Sarah sent us between 5-10 videos a day, and very detailed emails while she kept Lucy for over a week. We were impressed with the progress we saw but still skeptical, until we picked her up. Lucy was still Lucy, but this Lucy was a confident, happy, trusting dog. She deserved this and our lives have been so much better since! She walks beautifully on the leash, she meets dogs in a calm way, we can have people over and meet people out on walks. We took Lucy to breakfast recently and people came to pet her and Lucy wagged her tail and enjoyed it. I can’t say enough good things about this process, it’s helped Jeff and I so much, and it’s helped restore a balance in our lives. Before Sarah, Molly (dog) would have probably attacked Allie (cat) if we let her. Molly would bark hysterically, lunge at her, growl whenever Allie was nearby. I didn't think they would ever share space. We kept them on separate floors. With Sarah's training, Molly and Allie now very peacefully coexist in our home. Their relationship wasn't even our main goal when we hired Sarah. But Sarah's work is so comprehensive and so expert, that a few months into Molly's new life as a trained pup, I sent Sarah this photo with so much awe and excitement! I honestly never thought this would happen. Molly is a relaxed, trusting and mellow dog now - she has no reaction to the cat anymore and is actually quite sweet with her. I talk to all the animal owners I know about Sarah and her work. She is amazing. I have no doubt she can improve your life and the life of your pup - no matter the issue. I'm so glad we found her. We truly appreciate all of your help and guidance (and humor!) with Squish! Tuesday is our 'gotcha anniversary' with him... if you had told us we'd be where we are now- I don't know that we would have believed you! My wife and I just completed 4 training sessions with Sarah Russell of Upward Dog Services in Annapolis, MD - and wow, what an incredible experience! We have a 1-year old Cavalier King Charles Spaniel named Lady and recently added to our family another Cavalier named Poppy. Lady is a very sweet dog, but was not keen on sharing the undivided attention that she was used to receiving from my wife and me with this unidentified, 3 pound "intruder" into our peaceful home lives. Initially, their play was a little rough and we were worried that their relationship would not start off on the right foot, leaving us with two dogs that would not get along. In a bit of a panic, we reached out to Sarah for some help and she jumped on it right away. We decided to engage Sarah with the transition of bringing puppy into the home and also wanted her to help us with the dogs walking properly on a leash. Not only did we successfully accomplish these two goals, but we walked away with so much more. We got together with Sarah the very next Saturday and we were immediately impressed with her professionalism, intuition, and expertise. Within minutes into our first training session, both dogs were not only learning, but having a blast. Sarah makes training fun for dogs and their owners - and don't be mistaken, we are both being trained at the same time! - Training with Sarah is fun! Whether your dog is totally out of control or could just benefit from some fun and stimulating exercises, reach out to Upward Dog Services - Sarah Russell is the real deal! We cant say enough amazing things about Sarah and Upward Dog Services. A few months before we found Sarah, we had two rambunctious dogs. They were two of the hardest playing dogs our vet had ever seen! Unfortunately, Finn's big sister, Riley, had cancer and we all had to say goodbye. Finn always had a little anxiety when alone, but it was after Riley passed that his anxiety became unmanageable. We tried calming treats, pheromone sprays, frozen peanut butter toys, and even classical music, but Finn just continued to spiral. When he growled at a coworker, we knew we had to do something to help him. That's when we found Sarah. After speaking with Sarah and learning that Finn just needed to find his place in our smaller pack, we knew she was the right woman for the job. Finn spent a week with Sarah, 100% immersed in training. She gave us a private YouTube link that housed at least 60 videos for us to watch. Not only was Sarah training Finn and helping him, she was teaching and training us as well. When we went to Sarah's house on the 7th day to pick up Finn, I started to cry. I was so incredibly overjoyed at what Sarah had accomplished with Finn. Finn was proud of his new role. He was confident. He could walk calmly on a leash. He didn't guard and rush his food. In one week, Sarah was able to give us an amazing gift. She gave us back our Finny. Our homework continues and at times its hard to keep up with everything we've learned. But, now, we all have the tools we need for a happy home. We adopted Boomer almost 2 years ago and from the day we got him we were in love. He always wanted to play and give lots of kisses. Unfortunately about a year and a half into having boomer he became very territorial over things and started to become that way with me as well. Knowing that he is kind hearted we gave Sarah a call after hearing such great things about her services. Sarah could sense exactly what was going on with Boomer without us even having to tell her. She instructed us to take small simple steps initially to get him calm and feeling comfortable. From there she taught boomer to stay in his crate when guests arrived and how we should introduce them. Boomer was never a fan of his crate but after training with Sarah it seems to be his safe spot now. After our 4 sessions Boomer has continued to improve and we are able to take him out to socialize with friends both human and puppy. We are so happy Sarah was able to give us back the pup we fell in love with. Sarah's instruction is positive and rewarding, for both the human and dog. She promotes healthy human and dog behavior. This ensured that I could be confident and competent when training Carlos, our vibrant and active 1 year old lab. Carlos has had food (resource) guarding since he was 8 weeks old. I was able to learn how to adjust my behaviors to help Carlos. Sarah is very insightful and was able to look at the situation as a whole, something that is hard to do when you're the one living in it! I fell in love with a 6-week old puppy and brought him home. I struggled from the beginning with him not differentiating between the carpet inside and the grass outside when it was time to relieve himself. I tried everything: coaxing, spraying, pulling my hair out … nothing worked, and the problem was negatively impacting my relationship with the puppy. My veterinarian suggested Upward and I reached out to Sarah the same day. Through tears, I explained that my puppy and I were going to have to part ways. Sarah asked for an opportunity to work with him. That afternoon, I dropped the puppy off for a 7-day stay with Sarah. I visited him during the week and he was clearly happy and comfortable. Each day, I got videos from Sarah, encouraging e-mails and behavior updates. I felt like I was part of the process. After a week, I had a puppy with different behaviors. Sarah had three follow-up visits in our home and – each time the puppy saw Sarah – he got so excited! It was clear to me that he loved being in her company and was anxious to do what pleased her. Today, the puppy understands what he is supposed to do, and he does it. If you are at all unsure about whether or not to have your puppy/dog trained by Sarah, call me. I am giving Sarah permission to give you my phone number so you aren’t relying on a written testimonial. We adopted Sammie from a rescue league; we were her third home in about a month. She had a lot of anxiety, jumped up a lot and ate everything that came in her path. Sarah provided us with the tools to address this behavior. Not only did her behavior improve pretty much within the first week, but the tools she gave us are things we can continue to work on well into the future. Sammie is much more confident and comfortable and has become a loving member of our family. We are no longer afraid to have people over. I would highly recommend Upward Dog Services to anyone!!! We wanted a golden retriever in large part because of their friendly, social dispositions. We had no idea what we were in for! Our Pete is the sweetest dog, but was so overly enthusiastic in his love for all creatures that it was nearly impossible to walk him down the street, let alone have anyone come to our house without closing him in the mudroom. When other people weren’t around, anyone “new” entering the room (one of us coming back after a few minutes in another room) resulted in him dissolving into a puddle of excitement (sometimes literally leaving a puddle on the floor!) and overly affectionate pushing, leaning, jumping, licking, etc. Even when not greeting someone, Pete’s overall level of excitement was so high that even when sitting or laying down he was almost constantly panting. We needed to do something to reign in this enthusiasm and teach Pete how to express affection appropriately. When we started working with Sarah, she helped us establish and enforce clear limits on his behavior. She helped us understand not only the reasoning behind the new skills we were teaching Pete, but also his behavior and reactions. She also taught us how to teach and reinforce new behaviors, so we can now teach him new things on our own. Pete has stayed with Sarah twice, and each time come back a different, better version of himself. He clearly loves it there, which is obvious in the daily videos and emails we receive when he’s with Sarah. Her emails a pleasure to read - she has a wonderful way of conveying how well she knows and understands our dog, as well as what we can do to help him make better choices. Additionally, the in-home follow up sessions have helped us reinforce his new skills. He still gets excited when he sees her (and others), but he can now express that without totally losing it. And he can now walk down the street without even reacting to other people and dogs that we pass. I would wholeheartedly and without hesitation recommend working with Sarah. Her patience with us and with Pete along with her ability to explain what we’re doing and why make her a pleasure to work with. She has transformed Pete into the dog we knew he could be and we now have a dog that we, and others, truly enjoy being around. We want to THANK YOU so much for working with Dez! It’s really made a huge impact in our house and made him a much more peaceful dog. It’s been such a pleasure for us working with you, too! It’s obvious he has taken a liking to you, which says a lot. We heard about Upward Dog Services through a friend who we often vented about our dog’s behavior to. Our German Shepherd, Dez, was very anxious and energetic. His energy always seemed to result in negative habits including, very poor leash walking, jumping on the fence, jumping on guests that came to our home and constantly pacing and following everyone in the house around. He always had to be first in the room or through the door and it didn’t matter who he’d knock over on the way. We had visited other board and train locations we but disliked the idea of him being kept in a kennel most of the day and being trained for only 1-2 hours a day. We also worried that he would do well while in training and then would come home to our other dog and revert back to all his bad habits. What we loved about Upward Dog Services was that he got to stay at Sarah’s home with her family and her pets for the week. While we missed him dearly, the videos and daily email updates assured us that he was in great hands and was being worked with throughout each day with great progress! Sarah made us confident that when he came home we would have the tools to help Dez continue to improve even with our baby and other animals acting as distractions for him, and sure enough we saw a world of difference! Every bad behavior we expressed concerns about was addressed during his week with Upward Dog Services and during the follow-up sessions Sarah helped us tailor his training to better suit our home and our everyday routine. Now, Dez does not jump on guests that visit but he calmly greets them and warms up to them. He no longer follows us around every moment of the day, he is learning to relax on his place for a while in peace. He doesn’t barrel through the door when we go in the house anymore, but calmly walks in with us. And it is very enjoyable and peaceful to go on walks with Dez now. We are so happy we chose Upward Dog Services and had someone like Sarah to work with our Dez! He seems like a much happier and peaceful dog and we are so happy to see him continue to improve. We rescued Tucker after he had been found in a bear trap in the woods of North Carolina. I knew the moment we met him that he was meant to be a part of our family. His calm demeanor and kind eyes were so sweet. We brought him home, and we were amazed at how well-mannered he was. He never chewed on anything in the house, did not beg, never had accidents, walked well on the leash, and never stole food. But all was not perfect. Although the rescue organization told us that he was dog-friendly, Tucker definitely felt threatened by other dogs. When we walked him, he would bark and lunge at other dogs; trying to establish his dominance before they even met. On one occasion, he pulled free, and went after a neighbor's dog. Thank goodness, no one was hurt. We called Sarah for help. Within two days, she was at our house with her sweet dog, Cotton. We walked up and down the street toward each other with our dogs. We started with the dogs far apart, and gradually walked them closer and closer, clicking and treating Tucker for not reacting to Cotton. It worked like a charm. Tucker actually LOVES socializing with other dogs now. Six months went by, and Tucker started a new unwanted behavior - protecting us at the front door. One time he grabbed onto a woman's sweater and wouldn't let go. Another time he ripped a hole in the FedEx man's sock. Yikes! Again we called Sarah, and she quickly came over to help. She explained our dog's mindset. We needed to assure him that it was not his job to protect us at the front door. Through practice and consistency, he is now calm when we answer the door. We feel we have a trusted partner with Upward Dog Services, Sarah's ability training and understanding dogs is absolutely amazing. She intuitively knows exactly what motivates their behavior, and provides perfect solutions. And she is always accessible to answer any questions. Thank you Sarah! You are truly a blessing! Upward Dog Services strengthened my relationship with my dog in a way I never could have imagined. Sarah showed patience yet firmness not only with my puppy but also with me, taking the time to answer my endless questions and guide me through the many frustrations that came with welcoming a canine baby into my life. She made a point of explaining the importance of each step in the process so that I had a grasp of how my dog thinks and what motivates him. 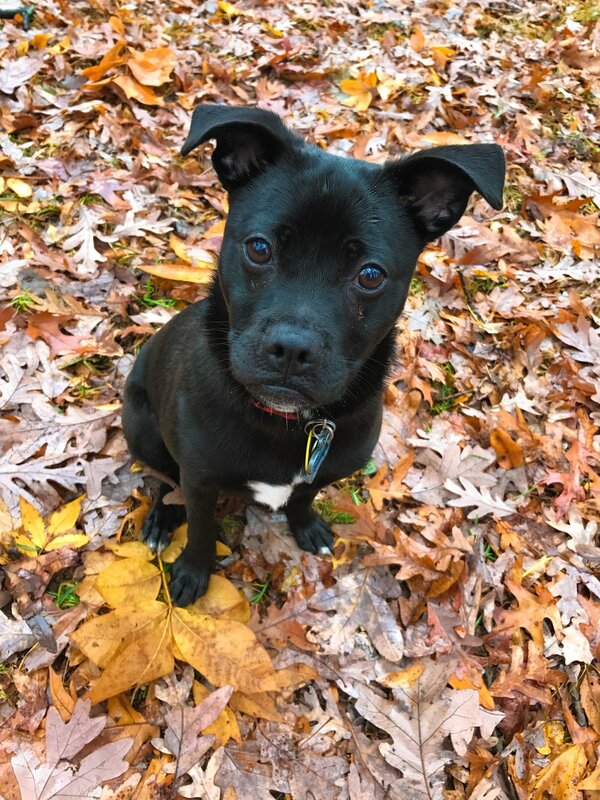 Thanks to Sarah's insight and understanding, I have a stronger sense of how to be a pack leader (or dog dad, if you will) that my pup needs me to be. Before sending Rocky to Sarah for the Board and Train program for a week, it was hard to even imagine a "normal" life in our house again. He was so nervous and out of control and just so big that he was unmanageable. The idea of buying a dog for two growing boys to love and grow with seemed brilliant. The unconditional love, the fun, and the bonding that the boys (including my husband), would have for a new puppy replaced all of my thoughts about the hard work that would be put into raising him. And, not only did we have a puppy, we went big and got a Great Dane, named Rocky. Rocky was too big, too nervous, and too much stress for all of us to handle. Frustration and stress filled our house, instead of the happiness and joy that I imagined. But after only a few days with Sarah, there was a noticeable change in Rocky. He is now confident, lovable, and easy to manage. We can't express how grateful we are that Sarah offered to help us gain control of our dog. She honestly brought joy back into our house and made us super proud of our dog! Sarah is great with dogs and her love and compassion for them is evident in everything she does.